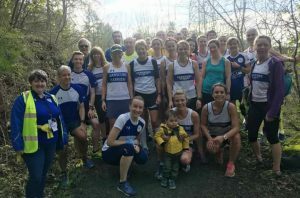 The sun was shining in Bluebell Woods for our 2nd fixture of the Summer League – Drumchapel parkrun. This is a relatively new parkrun to Glasgow and very local for a lot of our members. It’s a tough course, but the hills provided a different challenge to the flatter Victoria Park venue we’ve used in previous years. We had 28 Harriers donning the the blue stripe and topped the finishing table with the fastest 3 male & 3 females on the day too. (parkrun – it’s a run, not a race, but it’s a different story when there are Summer Leauge points up for grabs 😉 ) Congratulations to Matthew O’Brien celebrated his 100th parkrun by finishing 1st Male.